Women's durable gloves with a waterproof insert. These women's winter gloves keep you warm when the weather's cold and wet. They're made of durable ripstop, with synthetic material on the palm for extra grip. The soft inner lining wicks sweat off your skin, and the stretch fleece cuff helps seal out the cold. Great in cold and snowy weather which we see our share of here in New England. Great for removing with your gloved hands to remove snow from around your car door entry so when you open the door snow doesn't fall inside your car. Keeps hands warm while shoveling the snow as well. Love these gloves. Warm, great fit, perfect! Fit great. I was worried that even though they were small, that they wouldn't be small enough. They show on the website just red for the logo, but gloves had red stitching too. I wish they had used black instead. Overall nice and warm. I bought these in the crabapple color before they sold out. These are by far the warmest gloves I've ever had in my 30mum years of life. My hands ALWAYS get cold but these gloves keep them warm for a long time. I love the color too. Matches my Carhartt raspberry jacket. Warmest gloves and they're so cute!! Kept my hands and fingers warm in the bitter cold. However, after you have used them there’s no easy way to dry the inside from the sweat of your hands that has been wicked away. I used them for about 3 hours took them off and when I went to put them back on after a couple hours they were wet. I only gave them 4 stars because of this. Needs to have a removable insert so they can be dried. 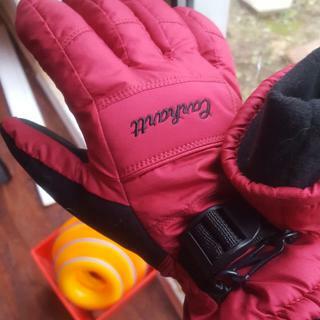 Are these gloves useful while working outside for long periods of time? More specifically, would you be able to use these at a barn where you'll primarily need them for warmth and dexterity. BEST ANSWER: No, they are not. The care instructions are as follows: spot wash by hand in lukewarm water with mild detergent. Hang to dry. Do not use hot water. Do not put in dryer.